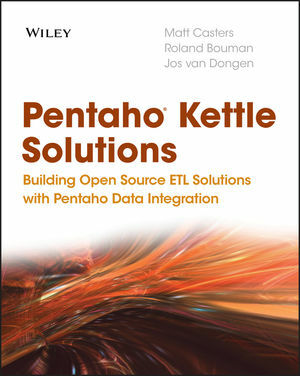 This practical book is a complete guide to installing, configuring, and managing Pentaho Kettle. If you’re a database administrator or developer, you’ll first get up to speed on Kettle basics and how to apply Kettle to create ETL solutions—before progressing to specialized concepts such as clustering, extensibility, and data vault models. Learn how to design and build every phase of an ETL solution. Get the most out of Pentaho Kettle and your data warehousing with this detailed guide—from simple single table data migration to complex multisystem clustered data integration tasks. Matt Casters is Founder of Kettle and works as Chief Data Integration at Pentaho, where he leads Kettle software development. Roland Bouman is an application developer focusing on open source web technology, databases, and business intelligence. Jos van Dongen is an independent business intelligence consultant and well-known author, analyst, and presenter.